In 2012, John came to Palestine with Remember Shakti for the first solidarity concert by major international artists. In 2010, John donated his entire cash prize award from the Jazzahead Festival in Germany to support Al-Mada’s music therapy center in Ramallah, the first of its kind in Palestine. Dear Friends: I would like to make a short statement. I will be making a second solidarity concert in Ramallah soon, and I’ve been asked a number of times why I do this. It is my personal conviction that the Palestinian people need much more international support. The situation has been bad for many people in Palestine for too long, and it is not getting any better, to the contrary, it keeps getting worse. My wife and I have been working alongside a very dedicated Arts-Based Community Development NGO in Ramallah known as Al Mada. There is a simple reason for our desire to support our friends in Al Mada, it is because they are helping to cure traumatized children and adults through the use of music and music therapy. We feel that in a world full, of conflict, this is the right cause. Al Mada’s work is non-political and so is our support for them. They work with justice, equality and dignity in mind, and so do we. It is our personal responsibility to show support and encouragement to the people who every day are helping children and adults to conquer their trauma, and give them another opportunity to live more free and creative lives. 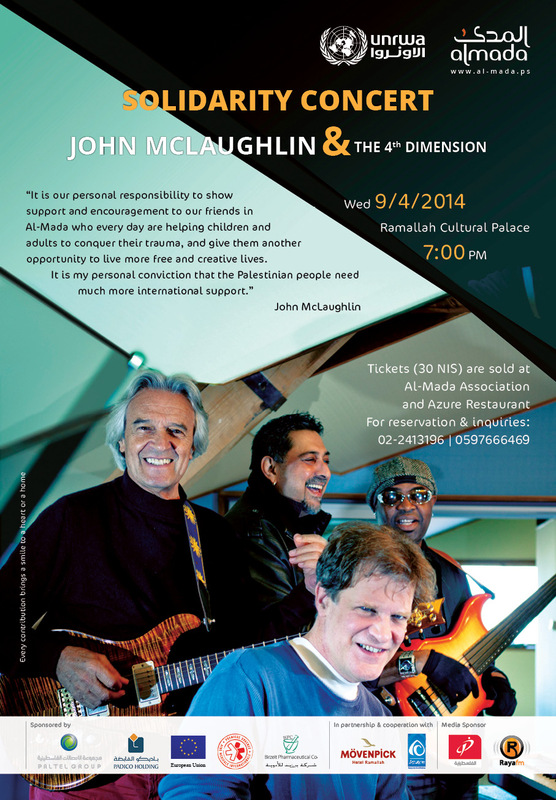 John McLaughlin is a Grammy-winning, jazz fusion guitarist and songwriter whose work defies strict categorization and continuously pushes musical boundaries. John is renowned for his cutting edge work in world fusion music through Mahavishnu Orchestra, Shakti and Remember Shakti, all of which combine rock and jazz elements with classical Indian music, creating a unique and complex musical style that continues to inspire contemporary musicians. John was born in England in 1942. After recording his first solo album Extrapolation in 1969, John moved to the US and went on to play and record with legendary musicians, such as the jazz trumpeter Miles Davis, jazz drummer Tony Williams, Spanish guitarist Paco de Lucia, latin rock guitarist Carlos Santana, and Indian tabla maestro Zakir Hussain, amongst many others. John has recorded more than 40 albums and continues to travel the world, playing at major international festivals and top jazz clubs. His 2009 collaboration with jazz pianist Chick Corea, Five Peace Band, won the Grammy Award for Best Jazz Instrumental album in 2010. He was named by Rolling Stones magazine as one of the top 100 guitarists of all time. The 4th Dimension is one of the many projects that John has worked on. This electric jazz quartet was founded in 2007 and currently features John on guitar, Gary Husband on keyboard, Etienne Mbappé on electric bass and Ranjit Barot on drums. The band’s first album To the One was released in 2010 and nominated for the 2011 Grammy Award for Best Contemporary Jazz Album. Their most recent album, Now Here This, was released in October 2012.
class="post-template-default single single-post postid-654 single-format-standard samba_theme samba_left_nav samba_left_align samba_responsive wpb-js-composer js-comp-ver-5.2.1 vc_responsive"